When I was elementary school age our neighborhood was majority Jewish for several years. We never celebrated the Jewish holidays but we learned about them. I remember singing the dreidel song in school and learning about the menorah. 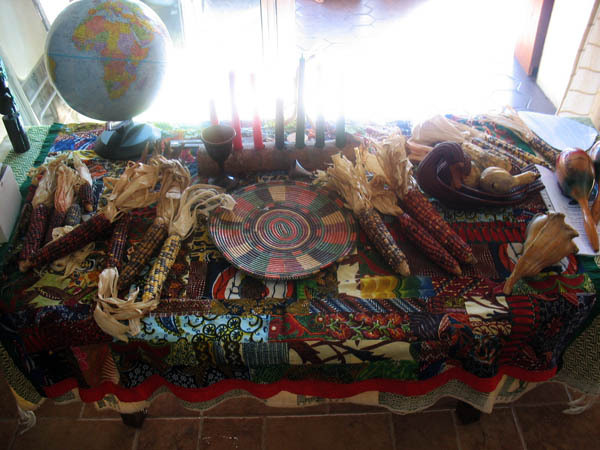 We have celebrated Kwanzaa in various ways over the years. Once again I bring you a reprint from Ruff Draft 1991. We didn’t celebrate it when I was growing up since it didn’t begin until the late 1960’s. Our children grew up celebrating either at home or in community celebrations. At one point we didn’t celebrate Christmas, only Kwanzaa but after the kids started school we gradually added Christmas back into the celebrations. Kwanzaa is an African American holiday started in the U.S.A. in the 1960s. The Kwanzaa table in this photo is BEAUTIFUL! Our family didn't celebrate Kwanzaa and I didn't attend any local celebrations and start observing the holiday until I was an adult and teaching about this celebration in school. Excellent article! I LOVE the tablecloth. Given that I've seen some lovely handmade quilts on your blog, I'm going to hazard a guess that you made the tablecloth. Just beautiful! Must have been quite a sight to see you all dressed up like that. But the funniest is trying to imagine you singing the dreidel song… who hasn't?!? The blending of cultures will do that to you! !